The Coolest Denim CEO Talks To It’s A Glam Thing! My personal style is very casual and laid back as you can see… Jeans and sweats all the way! What fashion trends in the denim world do you see happening that you either like or dislike? I really like the return of the sixties and seventies. The resurrection of acid wash and tie-dye denim is so cool and fresh. What I really don’t like is bell bottom pants and super flares though. After seeing girls in slimming and flattering tight stretch denim jeans and now going to bell bottoms is not an attractive look. What makes your jeans different than others? We are all about comfort and sculpting all women’s bodies into fitting into a perfect jean. The fabric moves with your body so it continuously keeps your body tight, while being able to wear our jeans all day and night… You will never want to take them off! What styles / collections do you have coming out later this year and into the future? We are in the midst of putting together our Spring collection. We will be adding the dye and super bleach denim into the line. We are also adding skimmers and flare legs. If you weren’t running GGJeans, what would you be doing? I would probably be really bored. This company is like my baby. Sarah Potempa was behind Anna Chlumsky’s wrap up braided bun for her “Living For Love” Broadway opening on Monday night. See below how you can get this gorgeous ‘do. 1) Start by creating a clean center part. Smooth all the hair from the roots to the ends with the SARAHPOTEMPA Ceramic Styling Iron. 2) Section out all of the hair from the left and right side and brush back in to a low ponytail, clipping out a circular section from the back of the crown with the SARAHPOTEMPA Darby Clip. Smooth the sides down with Aussie’s Miraculously Smooth Anti-Frizz Cream. 3) Using the SARAHPOTEMPA Wrap Up, pull the ponytail through, pinch it closed, wrap it up and bend it into a perfect bun. 4) Take the remaining section out of the clip and braid down. Secure with an elastic and wrap the braid around the bun and pin in place. The Skin Perfecter uses ultrasonic technology (28,000 ultrasonic vibrations per second) to deeply cleanse pores. The ultrasonic waves create a sudden formation and collapse of bubbles in a liquid form called cavitation. This formation creates a micro-jet like current that increases the permeability of the cell walls, allowing molecules to be more easily transported through the outermost layer of the skin. This in turn pushes out any impurities and cellular debris. TSA and environmentally friendly, what could be a better combination? emerginC scientific organics, the 100% natural, paraben and synthetic fragrance-free line, with a minimum of 70% organic ingredients in every item, introduces their first trial/travel set. This conveniently packaged set includes six of scientific organics top-selling products. In addition to emerginC’s ongoing commitment to healthy skincare, for every travel set sold, they will plant a tree in an indigenous area, around the world. The emerginC scientific organics’ trial/travel set includes: spirulina toner, kombucha cleanser, peel pad (3), eyelight cream, phytocell cream, and phytocell detox mask. From the brand new nail lacquer company, making its way stateside from Italy, this gorgeous collection of 4 mini nail polishes from FABY’s Fabulous collection feature high shine, quick dry time and a chip resistant and long wear formula. Includes Plastic Jewels and Neon Lights turquoise, Sugarful white, the firm and fizzy green Mint Bubbles and Hula Hoop Pink. For the mom that’s always busy and stressed out, treat her to a day at LifeSpa. Located in Life Time – The Healthy Way of Life destinations across the country, LifeSpa is the largest full service salon and spa in the nation with 98 locations across the country, including 1,400 highly trained technicians who deliver more than 1,000,000 customized treatments a year, LifeSpa treats its guests from head to toe, offering services for hair, skin, body and nails. Ladies I know you love your heels don’t you? But the pain of the heels throughout the day can cause our love to go to hate real fast. Inserts sometimes don’t seem to work, the balls of our feet are howling, and our arches just seem to feel like they may break in half. Now you can enjoy the sexiness of those heels, with out the pain, with Heel No Pain Foot Spray. Going to and from many events I tend to wear heels for hours at a time with no relief of being able to sit. two quick sprays before I put my shoes on and two more about 4 1/2 hours later I was able to wear my heels and enjoy the events without being in pain. My hips and thighs did not hurt either nor did my calf muscles. Now I did not spray those areas but taking away the pressure from my feet helped. So ladies don’t bother carrying another pair of shoes with you when you can carry a spray bottle the size and width of your index finger. Your “dogs” wont be howling anymore! For Softer Lips, Good Earth Beauty Lip Scrubs are Sensational! Find yourself wanting softer lips but lip balms don’t seem to be doing their job? Well then, give Good Earth Beauty lip scrubs a try! They come in a variety of different flavors like pink lemonade, bubblegum, vanilla lavender, strawberry, cherry vanilla, and chocolate. I have tried strawberry and chocolate and they were sensational! Not only did the scrub make my lips softer, but they’re also completely edible and taste great! Plus, they use all organic ingredients like organic sunflower oil, organic coconut oil, organic shea butter and organic jojoba oil to make your lips feel as soft and healthy as possible. So if you’re looking to get your lips in great condition, give Good Earth Beauty lip scrubs a try! This year, exclusively for Mother’s Day, Shea Yeleen (the fair trade shea butter skincare brand**) and ABAN (A Ban Against Neglect) have partnered for a second time to come up with a fabulous beauty bag, the Shea Yeleen/Aban Beauty Bag. Let me just say that this is an amazing collaboration. Not only is Shae Yaleen and ABAN helping mothers in sub-Saharan Africa, but their Beauty Bag is made from up-cycled plastics and the key chain that adorns them are crafted from recycled from glass (see photo below). I have my own makeup bag crafted in a traditional Ghanian print, there are four brilliant prints to choose from, and the prints are quite beautiful. Proceeds from the sale of the Beauty Bags help mothers in sub-Saharan Africa, pay for regular every day necessities for their children such as education, clothing and food, through jobs that provide a fair wage in safe working environments. The Shea Yeleen/Aban Beauty Bag is a multipurpose zip case made to feature traditional Ghanian prints. With the purchase of a bag, you will receive a Shea Yeleen Lavender Honeysuckle Body Butter and a Lavender Ylang Ylang Shea Butter Soap. I could smell the Lavender as I unzipped the bag and the scent was amazing. All of Shea Yeleen butters, balms and soaps are made with 100% unrefined shea butter, sourced from women-run cooperatives in Ghana. These Beauty Bags are perfectly designed for make-up or you can use it as a lunch bag or sewing/craft bag which I am tempted to do. Any Mother would love receiving this special gift knowing that the proceed will be going to a most worthy cause, MOTHERS! Creating the perfect art gallery wall in your home may seem like a difficult and daunting task but with a little pre-planning it’s really quite simple. Here are my step-by-step tips and instructions to make a masterful gallery for your wall showcasing your favorite artwork and family photos. Step 1: Collect your supplies. To bring your gallery wall to life you will need a few basic tools to help you complete the task. Here is a list of the basic supplies that you will need. A pencil, nails, newspaper or butcher paper, scissors, painter’s tape, hammer, measuring tape and a level. Now you are ready for step 2! Step 2: Select, gather and organize. I love an eclectic yet cohesive mix of artwork and photos hung on the wall. It’s important that the frames and content relate to one another to constitute a collection that will tell a story. Get creative. You can frame anything from photos, magazines, letters, artwork, famous quotes, works of music or pages from your favorite book with the same theme and color palette to make your wall visually appealing. Tip: Frame all your artwork and photos with one to two complimentary colors and use a variety of different sizes and shapes of frames to add contrast and texture to your gallery wall. Step 3: Frame to layout. Now that you have decided which artwork and photos you would like to use and framed them all so they look like a collection its time to decide on the perfect layout for your wall. Using the floor space in front of your gallery wall start by putting down your favorite or largest piece in the center. Begin arranging your artwork around your center anchor piece and work your way out. Keep moving things around and experimenting until you like the way it looks. This really is a matter of personal taste and there is no right and wrong. Just follow your instinct on what looks best to you. Tip: Keep a few inches of space between each frame to keep them close. A gallery wall is all about finding an organized balance in complete disarray. Step 4: Layout to Wall. Now that you have your layout designed take your newspaper or butcher paper and use your pencil to trace an outline of each frame creating individual templates, use your scissors to cut them out and then number them starting with your center piece as number 1. Use your tape measure to find the center point or points where your nail(s) will go for each piece of framed artwork or photo and pencil it in on your templates. Find the center of your wall and tape your center anchor piece template centered on the wall. Tape the rest of your templates on the wall keeping them close together in the same numbered sequence you laid out on the floor. Take your hammer and a nail and pound a nail through your template following your drawing. Remove the templates from the wall and replace them with your actual artwork and photos. Use your level to make sure your artwork is hung straight. Tip: You can use cut outs of fabric, decorative paper or knick-knacks in and around your artwork to fill space and add another dimension to your wall. There are no exact guidelines or rules to creating a picture perfect art gallery wall so embrace your life’s journey, showcase what makes you feel good and have fun with it! I would love to see and post photos of your completed gallery wall on my blog! Please e-mail photo’s to me at juleeireland@gmail.com. “Inspired by the devotion of the Franciscan Missionaries of Mary who welcomed and cared for those in need, the Botanical Cologne of Love gives a feeling of well-being and serenity.” What a lovely inspiration and a perfect gift for a special lady in your life this Mother’s Day. 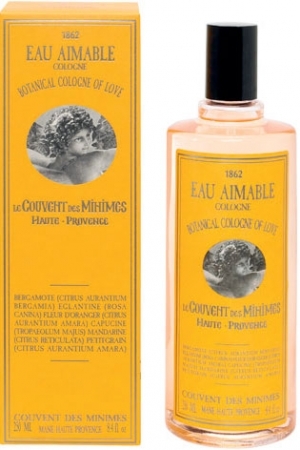 Known as the Botanical Cologne of Love, Le Couvent des Minimes Eau Aimable has an incredible light and alluring scent which I am going to delight my Mom with this Mother’s Day. I know she will love this fragrance. Le Couvent des Minimes Eau Aimable has a distinguished scent of Orange Blossom along with 5 Plants selected for their beneficial properties. ORANGE BLOSSOM for softness, BERGAMOT for serenity, WILD ROSE for hydration, NASTURTIUM for radiance and PETITGRAIN for harmony. Le Couvent des Minimes Eau Aimable is perfect as an after shower or bath indulgence or use as a fragrance any time of day or night. This exquisite, sparkling, scented water perfume will delight your senses with its soothing fragrance. Le Couvent des Minimes also has a fabulous scented hand cream set that will keep mom’s overworked hands hydrated. Included are three new fragrances, Minimes, Aimable, and Matines, the Le Couvent des Minimes hand creams naturally moisturize hands with Shea Butter and Beeswax, leaving them softly scented. From citrus, to orange blossom, to an earthy cedar and basil, there is a scent for every mom and the perfect gift for Mother’s Day. Consider Calgon for Mother’s Day it’s one of my Mom’s Favorites! Give the gift of an at‐home spa experience this Mother’s Day with a Calgon “Take Me Away!” Gift Set. This set includes a skin nourishing body cream, a delightful fragrance body mist, an ultra-moisturizing body wash and a shower pouf. Let Calgon take her away from her daily stressors, she’ll appreciate a little extra “me” time! Calgon® Full-Size Gift Sets products are available at Walmart.